0.875" diameter cam follower set for when running race cams, especially the RE284 spec race cam from CST. Faces re-ground to give correct specific crown shape and shortened for fitment to A-series block. 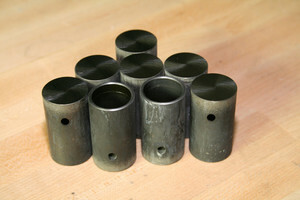 Using larger diameter cam followers for all race came was stongly recommended by Abingdon Special Tuning in the 1960s. Having the standard followers bored out as a one off machining event also eliminates alignment discrepencies caused by mass manufacture. This gives more accurate and consistent valve timing events. The block requires the standard follower bores bored/reamed out from the standard 0.812" to 0.875" to take these followers. Beware - follower bores are not vertical in the block.They are set at an angle of 2.5 degrees towards the crankshaft centreline.